Success as a professional athlete requires stamina, dedication and, like the comic-book hero Wolverine, a generous dose of internal healing power to survive the grueling schedule. Transferring success in sports to successfully running a business can be even more arduous. But two former football professionals, Eugene A. Profit and Cris Carter, did just that. When Eugene A. Profit, a former cornerback in the National Football League with the New England Patriots and the Washington Redskins, launched his company in 1996, he faced two major obstacles: The close-knit world of Wall St. and no prior experience in business. But 12 years after establishing Profit Investment Management, whose clients include Chicago Teachers? Pension Fund, The Boeing Co.
and the New York State Retirement Fund, Profit, a Yale University graduate, is making a name for himself in the world of finance. ?I never set out to be an entrepreneur,? Profit said in a telephone interview from his office in Silver Spring, Md. ?But businessownership is the best way to create wealth in this country.? Profit also wanted to serve and educate the segment of African-American population that knew nothing about equity, stocks and the benefits of ownership. His biggest challenges were learning how the practice of money management works, building a solid reputation and creating profitable portfolios for his clients. That took time and sacrifice. ?To build a successful track record you have to be in business three to five years,? says Profit, whose firm also has an office in Chicago. ?I knew I was going to be making a lot less money for a while and was realistic about the expectations.? Just as on the football field, discipline, teamwork and having the best team to work with proved a winning formula. ?The first lesson: no excuses,? Profit says. ?It?s harder to win when you don?t have the best talent. It is important to have the best running back and the best financial analyst on your side.? Christopher ?Cris? Carter, former wide receiver for the Philadelphia Eagles, the Minnesota Vikings and the Miami Dolphins, focused on the same principles of teamwork and accountability when he and his brother John established Carter Brothers L.L.C. in 2001. The Atlanta-based firm specializes in fire alarm systems and security and recently won a contract to set up the alarm systems in Marriott International?s Southern California hotels. 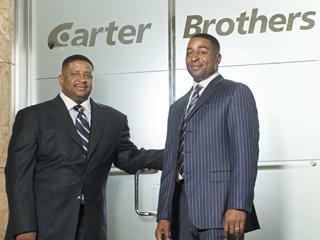 ?When we started Carter Brothers, there were very few African-Americans in the fire and security industry,? says Cris Carter, who also is a football analyst at ESPN. ?John and I wanted to established a legacy for our family.? In order for any organization to succeed, each individual?s talents must be recognized and valued. In both football and business, you must put in the right person in the right position at the right time to be successful,? he said by e-mail. knew that we would eventually work together.? Their firm was deemed ?Ambassador of Security? at the 2008 Electronic Security Expo sponsored by the National Burglar & Fire Alarm Association in Baltimore. Carter concedes that his high profile as a star player and his current work with ESPN?s Sunday NFL Countdown have opened many doors for his entrepreneurial agenda. However, his ability to transfer the ?team first? concept from the playing field to entrepreneurship has been key to his success in business. ?My visibility doesn?t hurt, but it is all about the hard work, dedication and ingenuity of our team members,? he says.